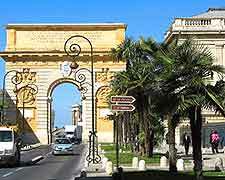 Montpellier is a relatively compact city, so it is easy to travel between most major attractions either on foot or bicycle. In fact, as many streets are either cobbled or pedestrianised, it makes sense to leave the car behind when you're sightseeing in the city centre. 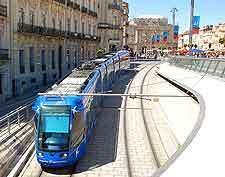 If you are planning to head out of the city, however, a hired car or Montpellier's comprehensive public transport system make good alternative methods of travelling around. Bus transport conveniently uses the same tickets and day passes as Montpellier's trams. The various travel options are listed below. 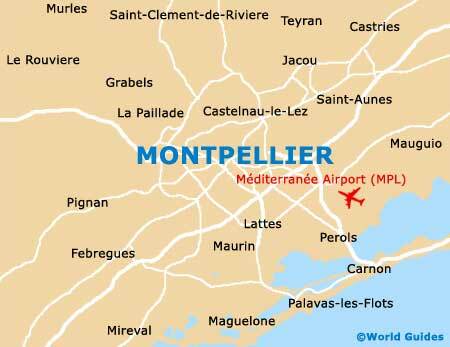 Montpellier Méditerranée Airport, formerly known as Fréjorgues Airport, is situated on the outskirts of the city. The airport operates services to the major airports in France and the rest of Europe. 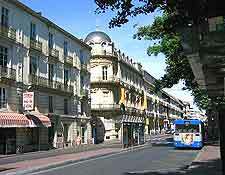 A regular bus service provides inexpensive travel to and from the centre of Montpellier. There are a small number of car parks in the centre of Montpellier. However, it's not an easy city to navigate and traffic can be fairly heavy, particularly during peak holiday periods. Hire car transport does allow you greater flexibility and freedom should you wish to explore the wider region. Whether you're planning to travel to quieter corners of the Languedoc-Rousillion area or head in search of a deserted beach or two along the Côte d'Azur, Montpellier has an extensive road network. Motorways also serve destinations further afield, such as Paris and Barcelona. Book your Montpellier Car Rental here. Montpellier has an extensive network of bus services, many of which operate from outside the train station. Visitors should note that bus transport is limited on weekends and during the evening. Buses travelling in the direction of the coast and surrounding villages leave from the regional bus station near the central Place de la Comédie. Bus services operate between Montpellier and Palavas-les-Flots, Saint-Jean-de-Vedas, Juvignac and Maurin. 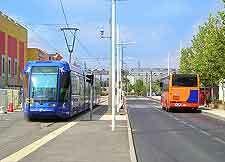 Two tram lines currently operate in Montpellier. They take in the train station, Place de la Comédie, Corum and the University. In general, tram transport frequently travels during the day, but not as often during the evening. Tram services operate up until 24:00. There is a taxi rank at the train station, with drop-off on the upper level of the station and pick-up at both platform and upper levels. Taxi transport is also available elsewhere in the city, although taxis are not often hailed from the road. It is advisable to call a taxi company in advance to arrange travel and a pick-up. A transport map is available from Montpellier's Tourist Office, which shows the best places to cycle in the city, including a network of cycle lanes. A cycle path provides travel alongside the River Lez, starting in Montpellier and all the way to a nearby beach at Palavas-les-Flots. The trip takes approximately one hour. Bikes can be rented from the TAM Velo office, located close to the train station.